After the Opium Wars in the 1840’s China was forced to open some of its territory to foreign trade. The preferred medium of exchange was the silver Mexican Peso which had a weight and fineness based on the earlier Spanish Dollar ie 27 grams at 0.903 fineness. The US silver dollar was not popular and often not accepted in Asian trade because it was ~0.5g lighter than this standard. This inconvenienced American businesses because they had to buy Mexican Pesos to use in trade. 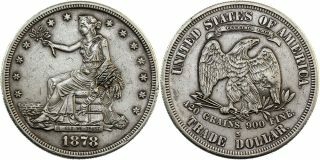 From 1873 to 1878 the US government issued a silver coin that was 420 grains (27.2 grams) and 0.900 fine, specifically for export to the Far East for use in trade. They were minted at Philadelphia (no mintmark), San Francisco (S mintmark) and Carson City (CC mintmark). The obverse has Liberty Seated and the date. The reverse has an eagle with legends UNITED STATES OF AMERICA TRADE DOLLAR and 420 GRAINS 900 FINE. They caused some problems within the US when considerable numbers were brought back after the silver price dropped. The were demonetised in the US but further lots were struck for export until 1878. They were withdrawn from the US after a few years but continued to be used in oriental trade long after that. As a result many surviving examples are worn. Apart from a couple of scarce date/mintmark combinations these coins are quite common in moderate condition. They are readily obtainable from the US where a decent example would cost about AU$300, but not seen very often in Australia. Here is an example that turned up in a recent Australian auction. Although not showing lots of wear it sold cheaply because it is crudely plugged (although not described as such!). This sort of treatment is not unusual as these coins were treated as a commodity. Many are punched with chinese characters – “chopmarks” which indicate a coin has been checked for weight and fineness. Other countries – Chinese imperial and provincial governments, Japan, France, Britain also issued trade dollars over the next 60 years. Some of the Chinese coins in particular are rare and genuine examples sell for many thousands of dollars. Putting together a collection of trade dollars is a common theme for Asian collectors. HOWEVER, Trade dollars, including the US coins are among the most faked series in all areas of numismatics. And some are very good!! General advice is to buy only certified coins from a reputable source. Now fakers find it easier to fake the certification capsule as well.